Linksys routers have a built-in firewall to prevent malicious programs or hackers from entering your network and accessing your computer files. Since this firewall has been set to prevent most programs or applications, you will have to manually configure your router’s settings to allow the programs or applications you want to use. Such applications can be used for Xbox® or PS3™ gaming consoles. By setting up Port Range Triggering, your gaming consoles will have access to the Internet and game servers since this feature allows the router to let specific requests from computers in your network to pass through the Internet, and vice versa without any issues. For you to configure such settings on your router, you must retrieve certain port numbers exclusively assigned to your gaming console. You may contact the console’s manufacturer or refer to your Xbox® gaming console’s documentation for its specific port numbers. You cannot connect or stay connected to the online features and services on your Nintendo Wii™, Xbox 360® or PlayStation®3 game console. You have multiple game consoles of the same type and would like to share a single Internet connection for online gaming. You cannot establish a secure or Virtual Private Network (VPN) connection between your home and office. You have multiple devices or computers that use the same ports to transmit and receive data over the Internet. 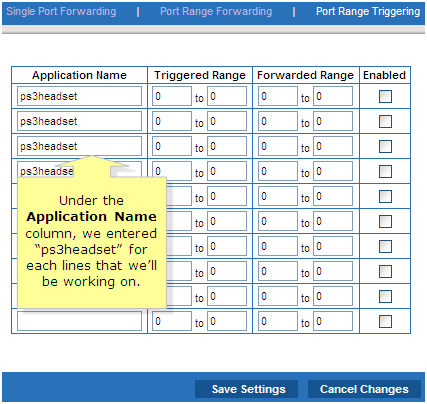 These instructions below will guide you on how to set up Port Range Triggering on Linksys Wi-Fi Routers. If you’re using a Linksys Smart Wi-Fi Router, click here to learn how to set up Single Port Forwarding. Consult your device's documentation or online support site to find out what ports you need to trigger for your device as they differ depending on the application being used. If you are a DSL Internet subscriber, your DSL modem should be set to Bridge Mode. Otherwise, the Port Triggering feature on the router will not work. Consult your modem's documentation or online help for instructions, or contact your Internet Service Provider (ISP) and request that your modem be set to Bridge Mode. NOTE: If you are unsure of your Internet connection type, contact your ISP. In this example, the ports for the PlayStation®3 game console will be triggered to allow the use of a USB or Bluetooth headset for online chat and gaming. Access your router’s web-based setup page. To learn how, click here. If you’re using a Mac® computer, click here. Click the Applications & Gaming tab, then click the Port Range Triggering sub-tab. Under the Application Name column, enter “ps3headset” for each of the lines that you’ll be working on. NOTE: You may enter a different name if you like. In this example, a total of four (4) ps3headset lines are allocated. NOTE: In this step, completing each field entry starts from left to right. ps3headset line 1 – Enter the first value which is port 80. Since this is just a single port, repeat this value in all four (4) fields under both Triggered Range and Forwarded Range columns. ps3headset line 2 – The next port value has a range between ports 6000-7000. So, enter “6000” in the first field and “7000” in the second field, under both Triggered Range and Forwarded Range columns. ps3headset line 3 – Enter the next value which is 10070. Since it’s a single port, repeat this value in all four (4) fields under both Triggered Range and Forwarded Range columns. 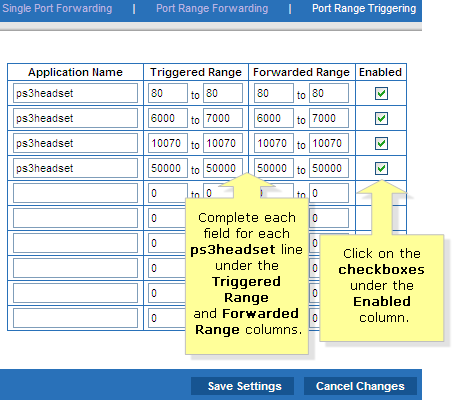 ps3headset line 4 – Enter and repeat the last value which is 50000 in all four (4) fields under both Triggered Range and Forwarded Range columns as well. Click on the checkboxes under the Enabled column. Once your changes have been saved, a confirmation screen will appear. Click Continue and close your Internet browser. You should now be able to use your USB or Bluetooth Headset without any interruptions. Follow the same instructions for your other game consoles and devices.